I've had a close look at your coordinates and all appear to be out the same amount. While I'm sure you have them centred, I think it's to do with the size of the army shadows themselves. It looks like they are 21 pixels in size, when you really want to go with even numbers with a minimum of 22 pixels. Perhaps another little thing to consider would be the territory names. If you bolded them up a bit or made them a bit darker, they should be a bit easier on the eyes. As it is, I'm having a hard time reading some of the names, especially on the small map in Noord and Zuid-Nederland. KEYOGI wrote: I've had a close look at your coordinates and all appear to be out the same amount. While I'm sure you have them centred, I think it's to do with the size of the army shadows themselves. It looks like they are 21 pixels in size, when you really want to go with even numbers with a minimum of 22 pixels. I will change the armycircles into 22 pixels. About the names, I tried to make them a bit darker in the smaller map, but now the names are overpowered. Now the names are too much in the picture. But I shall do in my powers too make them more easier for the eyes. Tomorrow I add the new update. Below the latest development of the map BeNeLux. - Armycircles on the large and small map are now 22 pixels. - The names of the countries are on the small map stronger (a bit darker). So let us know what U think of the armyshadows with numbers on the map BeNeLux so far. For the most part, the names on the small map easier to read, but they seem to be blurred or smudged looking in a few places. And the Capital's legend looks little unreadable now. If the boldness doesn't work there, I'd revert back to normal thickness in that area, or if you really felt like it you could increase the size of the capital legend on the small map. indeed some names like twenthe or salland look blurry. and one more thing. maybe i'm just tired and my eyes are playing tricks on me but it seems the blue names have a white glow while all the other names don't. why? Hm, I think the white glow was added to have the dark text stand out a little from the dark background. AndyDufresne wrote: Hm, I think the white glow was added to have the dark text stand out a little from the dark background. for me it's clearly visible without the glow but if it is a must then i think the glow should be present in all the names for consistency reasons. DiM wrote: for me it's clearly visible without the glow but if it is a must then i think the glow should be present in all the names for consistency reasons. They all have the same shadows, but with different background colors, they seem too look different. Marval, are the above images the latest updates? AndyDufresne wrote: Marval, are the above images the latest updates? The large map on the UPDATE 34 XML is the latest update. - No more blurry names of the countries. - Normal size of the Capital names. - See for the large map previous update (UPDATE 34 XML). So let us know what U think about the country names (with or without inner glow) on the map BeNeLux so far. Hm, regarding the glows, I rather like them. They are mostly noticeable in the blue continent and the ocean, but they can be seen in green, red, and in the nonplayable area where the text is. I think the best version is with them. As for the small map in general, I think the capitals legend is back to normal and looks fine. As do the names. AndyDufresne wrote: Hm, regarding the glows, I rather like them. They are mostly noticeable in the blue continent and the ocean, but they can be seen in green, red, and in the nonplayable area where the text is. I think the best version is with them. Does this mean that the map is ready for quenching? I would vote for the Inner glow. Thanks to you all for supporting this map. Also thanks for those with nice and critical suggestions. We just wait, what now will happen. Its up to Andy and Keyogi. Would you be so kind to please provide me with the text links to the large and small map, along with the XML? AndyDufresne wrote: Would you be so kind to please provide me with the text links to the large and small map, along with the XML? I've sent you a PM with the links. The Final Forge period has concluded for the BeNeLux Map. All objections have had their time. The Foundry and I hereby brand this map with the Foundry Brand. Let it be known that this map is now ready for live play (barring any Lack vetoes). Marval....congratulations....long haul to the finish line....worth the effort I'm sure! Everybody thanks for your support. 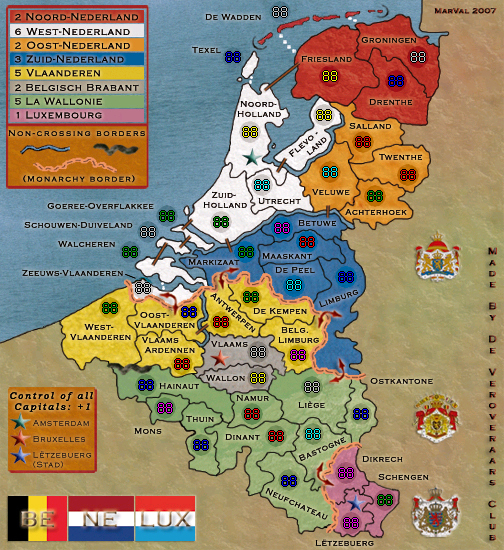 They started the idea for a BeneLux map on the Dutch Language Forum. And the three of us we brainstormed how can do it. With there help and support, we managed to make the Final map! Again my thanks to you all.